Door is the theme this week at Scribble Picnic. Thanks to Michael for hosting. 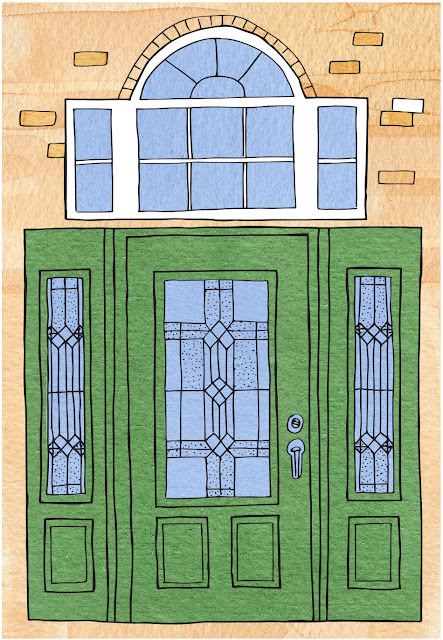 I decided to make a good sketch of my front door and paint it. Actually, this has been a task on my To Do list for a while, so now I had a good excuse to sit down and sketch it. I’m thinking of painting the door. Currently, it’s a dark Kelly green color. Now I can use Photoshop and play around to see what color I want to change it to. Maybe a red door? Or a darker green? Maybe grey? I would love to paint it turquoise but I don’t think it would look right with the bricks that are around it! Oh, well. I’ll figure something out! 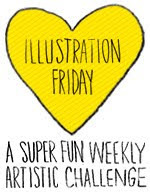 See you next week…the theme is Potted Plant in case you want to join us! I like your idea for turquoise...but I see your point. Do the stained glass windows have any color in them? Maybe a color from there would work? Lovely entry BTW! 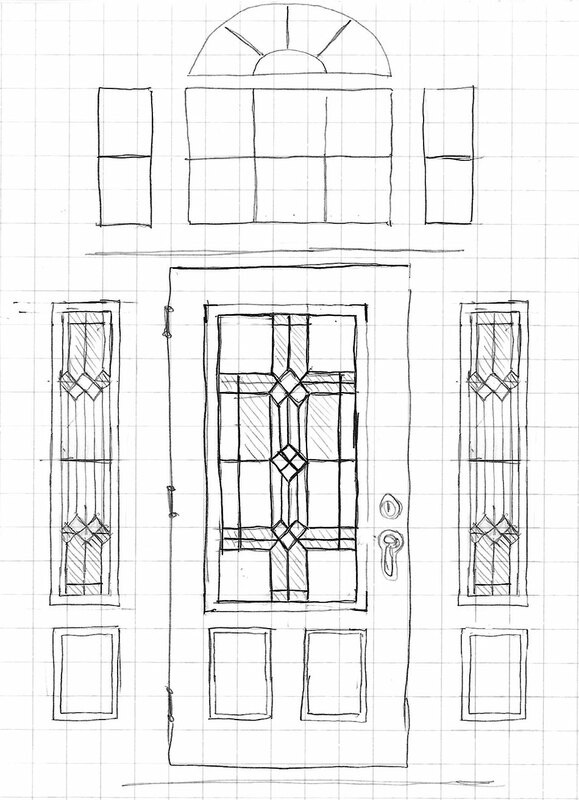 What a gorgeous front door you have, and you did a great job sketching it! I'll be curious to know which color you decide to paint it. We really need to completely replace ours, but I just can't decide what style to go with. that is a really nice sketch and very handy too :) how about a dark blue? WOW...what a lovely front door! Nice work! I love turquoise doors on adobe brick homes in places like Arizona. It's one of my favourite colours. Going by the colours in your sketch, I'm thinking navy blue or burgundy? Great sketch. Love that you started on graph paper. I love your green door. Ours has been a lovely shade of blue for the last 30 years. I wouldn't begin to guess what different color you should have. You have a marvelous door. I love it. Any color would look great, but brick red, or turquoise would be my pick...wonder which you will choose. 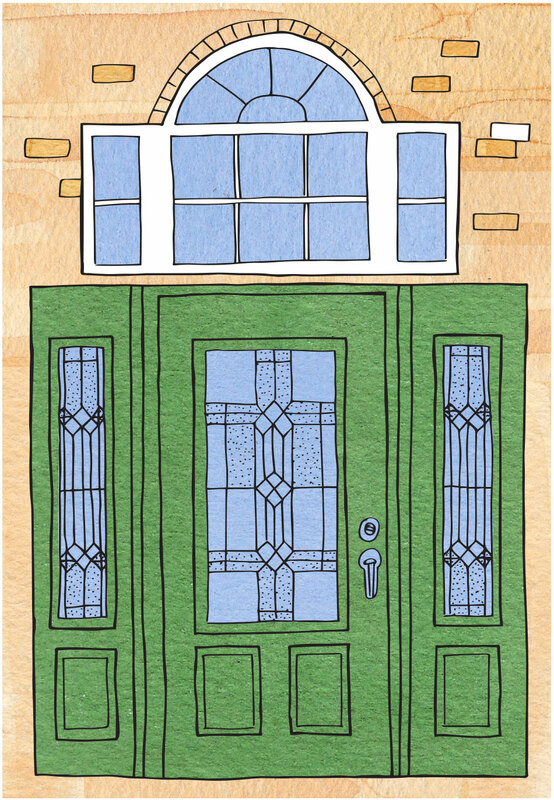 I like of liking the green of the door, it works with the blue of the windows, it's actually a nicely designed door. We are changing our front doors too. They are wood but after 13 years and a few tries at sanding and staining and varnishing they just don't look right anymore. What a great way to figure out your colouring. I found a door place that lets you take a picture of your door and then try their various doors. I might do that. 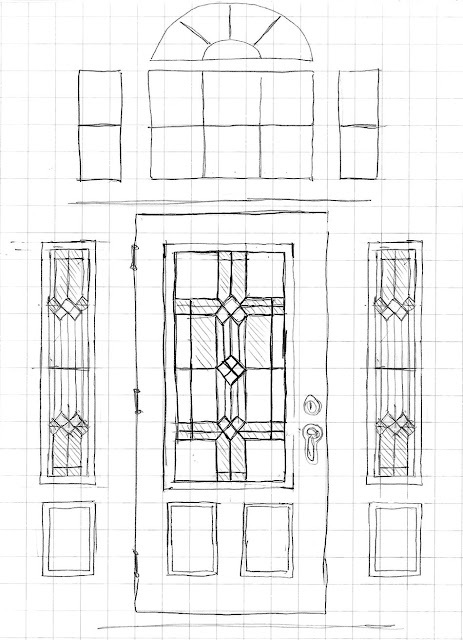 Never thought of graph paper for sketching. Great idea. Your door sketch it lovely as is the door itself, Sue! I'm sure the house must be too then. I love the green colour and am sure you will find something else jsut as great too. All depends on the rest of the house and surrounding colours, other doors nearby, etc. What a great drawing and so glad you could use this prompt to start figuring out something so practical for you and your family! Even better! Sorry to be visiting everyone so much later than I would normally!